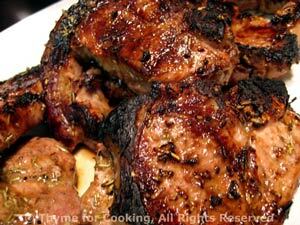 Grilled Lamb Chops, with Lemon and Rosemary, easy gourmet dinner recipes. An easy, relaxing dinner. I did the Zucchini Sticks and Potatoes in the oven - easy, and the oven doesn't add heat to the kitchen like the cook top does. Is there a better match than lamb and rosemary? This simple marinade, with a bit of soy sauce and garlic, imparts a lot of complex flavors to our lamb chops. Great grilled but equally good done indoors. A grill pan for your stove top is nice but a hot nonstick skillet works fine. Mix lemon juice, soy sauce, oil, garlic powder and rosemary. Pour over lamb chops and allow to marinate for 15 - 30 minutes. Remove chops and discard marinade. 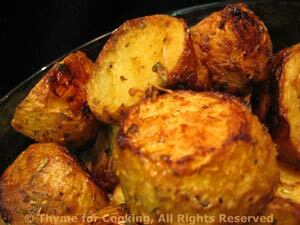 Either cook on barbecue grill or in a non-stick skillet over medium-high heat. In either case you will cook chops for 2 - 5 minutes a side depending on thickness and desired degree of doneness (I don't know if that is a word - but you get the idea). We do ours on a hot grill 2 minutes a side for medium rare. When you think they might be close take one off, cut into center and peak. You can always put them back on to cook more - you cannot undo... When done to your liking remove from heat and serve. These are quickly prepared; bake, unattended and end with a nice crunch. Easy peasy! And one can't have too many zucchini recipes in summer! Wash zucchini and slice off stem and blossom ends. Cut it in half or thirds the short way. You want pieces 2 - 3" long (5 - 8cm). Cut each section into sticks about 5/8" (1cm) square. They won't all be perfect, coming from a round vegetable, but close is good. In a flattish bowl whisk the mustard and the egg together. In another flattish bowl or plate mix the crumbs and cheese together. 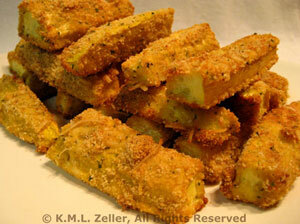 Roll the zucchini sticks in the egg, then the crumbs. Place on a nonstick baking sheet. Bake at 400F (200C) for 35 minutes, until coating starts to brown.